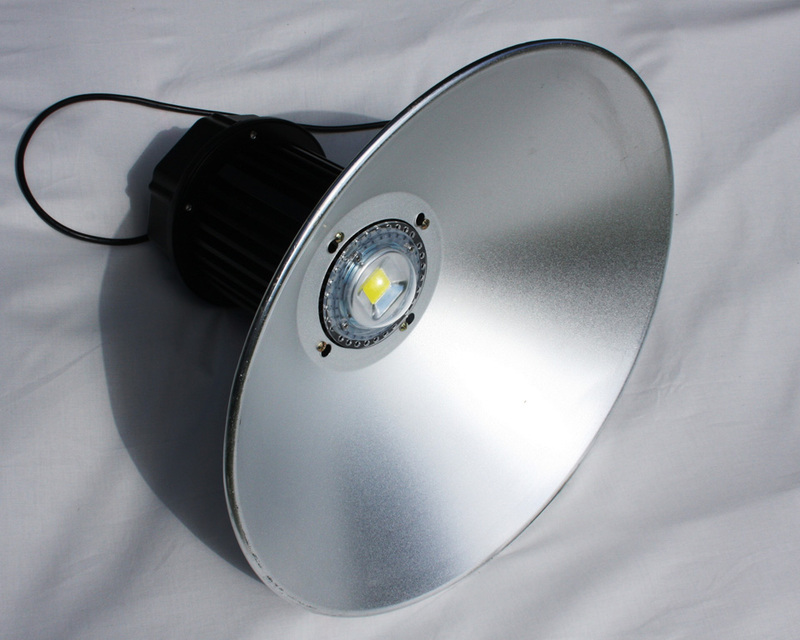 Glo Worldwide presents a high bay led lamp with a very big led chip. This one chip consumes almost 100 Watt. It emits a lot of cold white light. Luminous intensity Iv 2869 Cd Measured straight underneath the lamp. 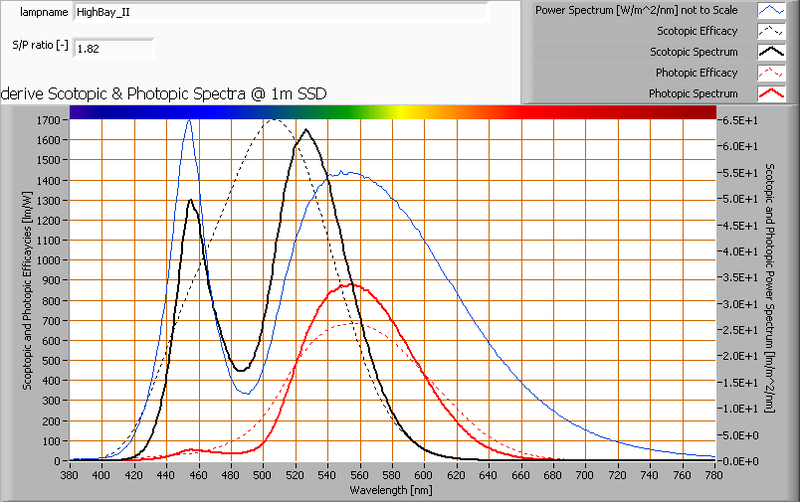 Illuminance modulation index 0 % Measured straight underneath the lamp. Is a measure for the amount of flickering. Beam angle 114 deg 114º for all C-planes as this lamp is symmetrical along its first axis. 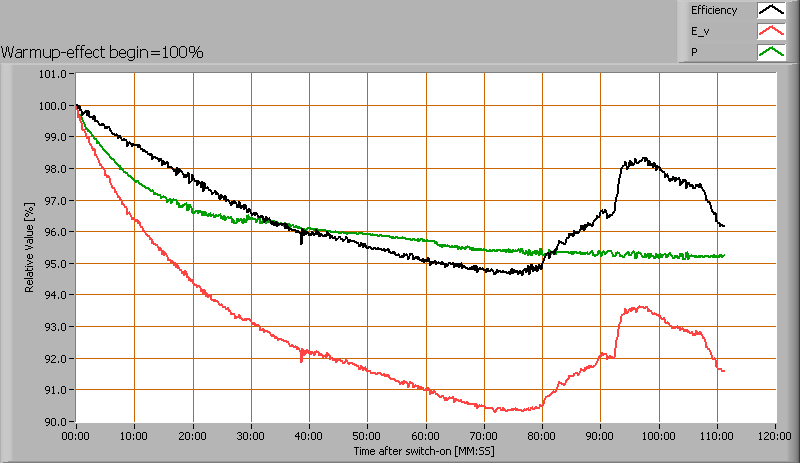 Power Factor 0.97 For every 1 kWh net power consumed, there has been 0.2 kVAhr for reactive power. CRI_Ra 69 Color Rendering Index. Fitting 230V This lamp is connected to their 230 V rail system. 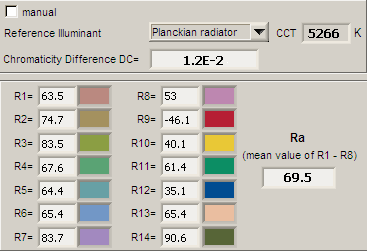 PAR-value 23.2 μMol/s/m2 The number of photons seen by an average plant when it is lit by the light of this light bulb. Value valid at 1 m distance from light bulb. PAR-photon efficacy 0.6 μMol/s/We The toal emitted number of photons by this light, divided by its consumption in W. It indicates a kind of efficacy in generating photons. S/P ratio 1.8 This factor indicates the amount of times more efficient the light of this light bulb is perceived under scotopic circumstances (ow environmental light level). H x D external dimensions 365 x 500 mm External dimensions of the lamp; this is the diameter of the reflector and the total height of the reflector and power supply housing. D luminous area 500 mm Dimensions of the luminous area (used in Eulumdat file). 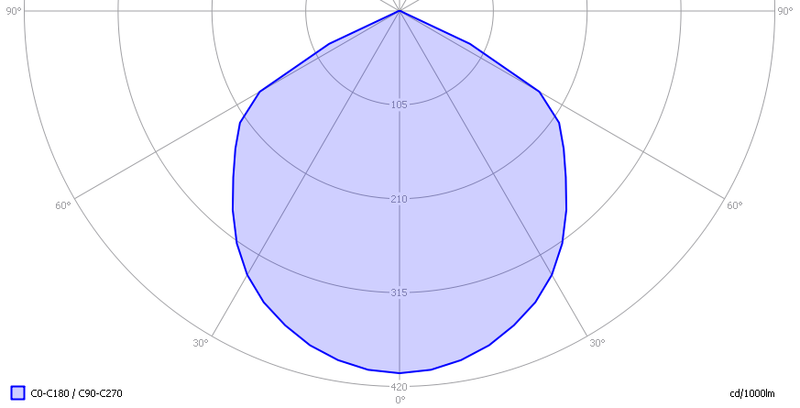 This is the diameter of the reflector at the front of the lamp. General remarks The ambient temperature during the whole set of measurements was 26 deg C. The temperature of the glass around the chip gets 28 degrees hotter, the area between the fins of the heatsink gets about 38 degrees hotter, and the back side of the power supply housing gets about 22 deg hotter than ambient. Warm up effect: during the warm up time the illuminance decreases with 8 %.Voltage dependency: the power consumption and illuminance was upon request not tested in a wide range. At the end an additional photo. The overview table is explained on the OliNo website. Please note that this overview table makes use of calculations, use this data with care as explained on the OliNo site. 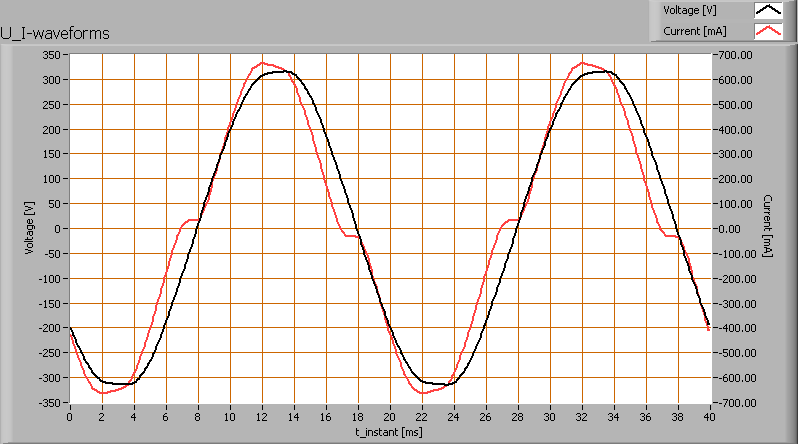 E (lux) values are not accurate, when within 5 x 500 mm ≈ 2500 mm. 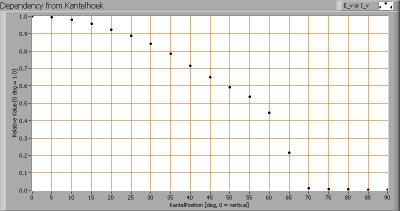 Within this distance from the lamp, the measured lux values willl be less than the computed values in this overview as the measurements are then within the near field of the lamp. 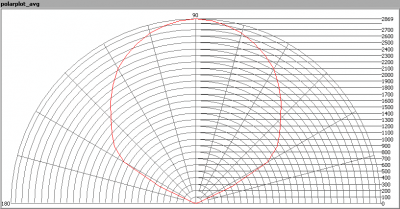 This light diagram below comes from the program Qlumedit, that extracts these diagrams from an Eulumdat file. It is explained on the OliNo site. It indicates the luminous intensity around the light bulb. The plane C90-C270 has the same beam as the C0-C180 due to the symmetry around the 1st axis. 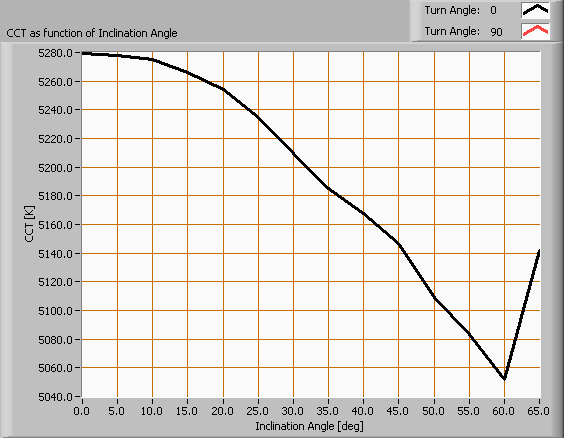 When using the average values per inclination angle, the beam angle can be computed, being 114º. 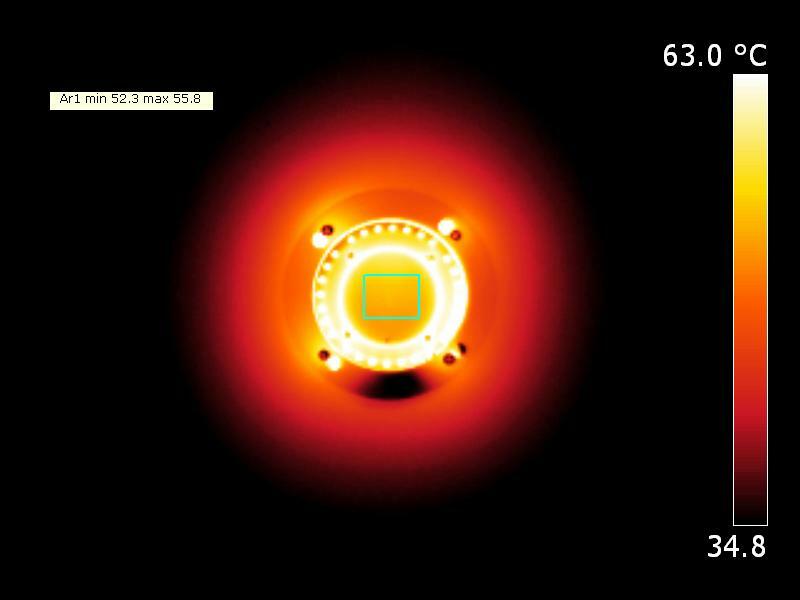 The result of this computation for this light spot is a luminous flux of 7081 Lm. The luminous flux being 7081 Lm, and the power of the light bulb being 99.9 W, yields a luminous efficacy of 71 Lm/W. 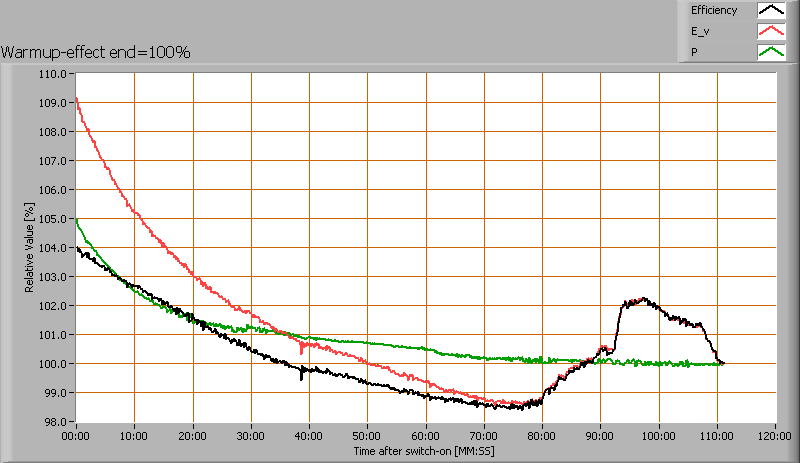 A power factor of 0.97 means that for every 1 kWh net power consumed, a reactive component of 0.2 kVAr was needed. Of this light bulb the voltage across ad the resulting current through it are measured and graphed. See the OliNo site how this is obtained. 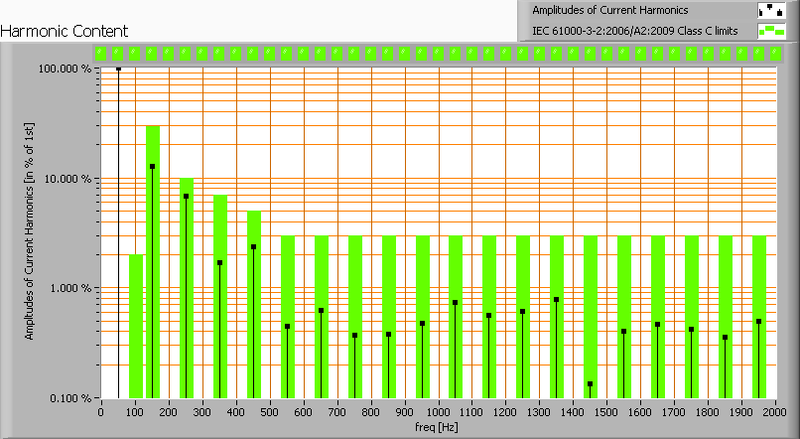 This waveforms have been checked on requirements posed by the norm IEC 61000-3-2:2006 (including up to A2:2009). See also the explanation on the OliNo website. There are limits for the harmonics for lighting equipment > 25 W and these limits are fulfilled. The Total Harmonic Distortion of the current is computed as 15 %. 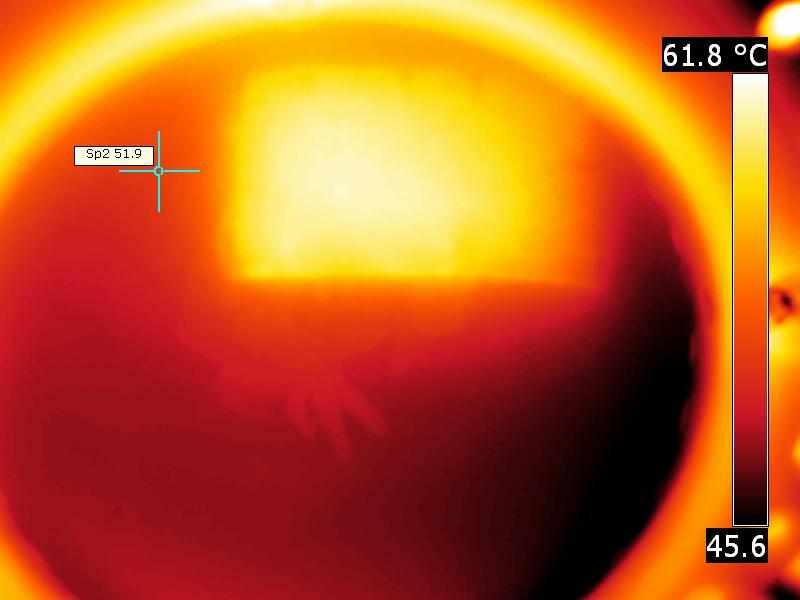 Temperature image of the glass around the chip. 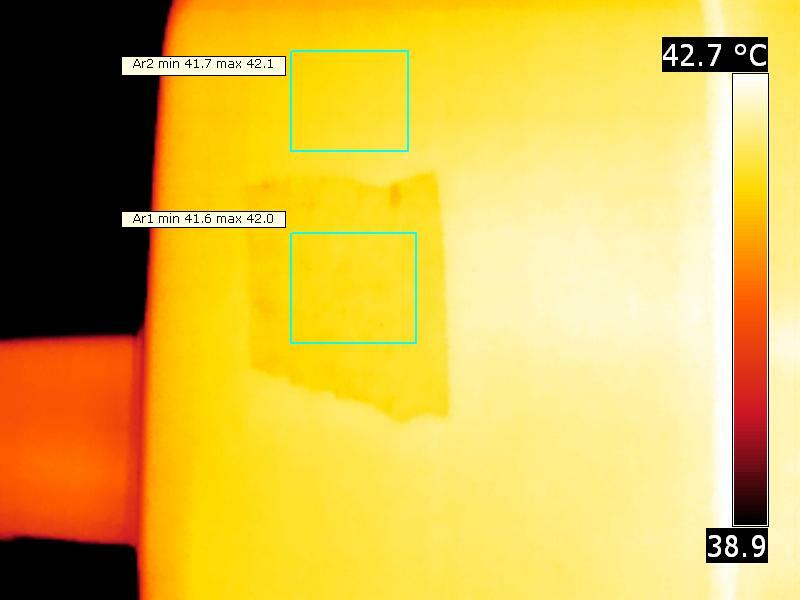 The top image is taken with an emissivity of 0.95, equal to the tape. 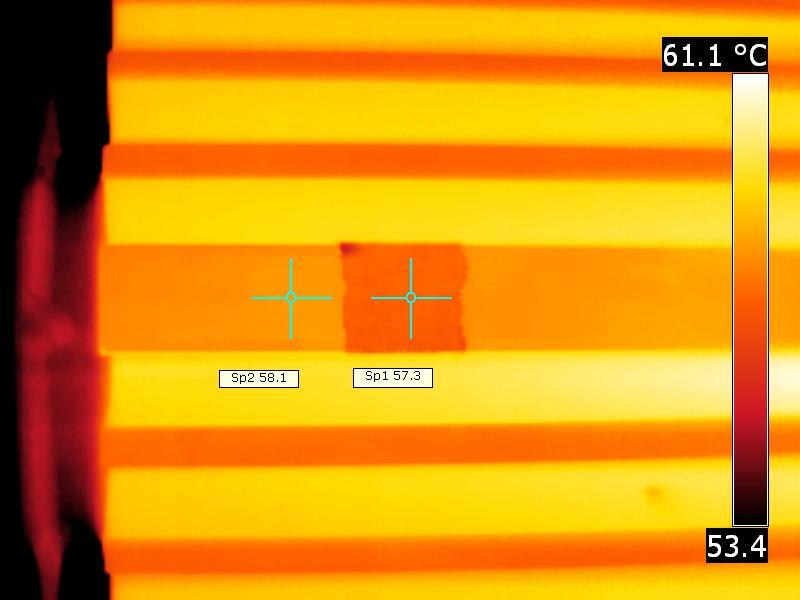 The temperature found must then also be on the rest of the glass, and with a setting of 0.70 for emissivity this temperature on the glass is found. 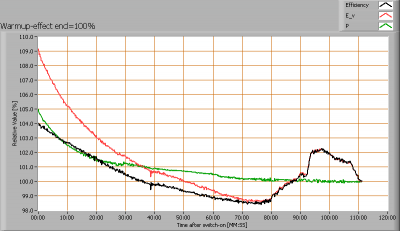 The resulting temperature image of the glass around the chip, getting to about 54 deg C (ambient was 26 deg C). Temperature image of the heatsink. The emissivity of the black material of the heatsink is about 0.98. 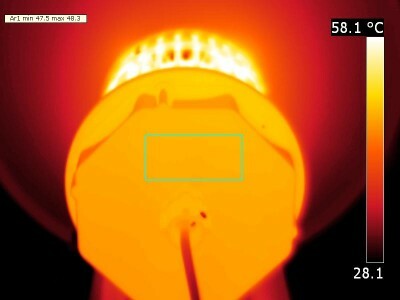 Heatsink temperatures, the hottest closer to the led chip. Maximum temp is 38 deg C hotter than ambient. Temperature image of the back side, seems to be 0.95. 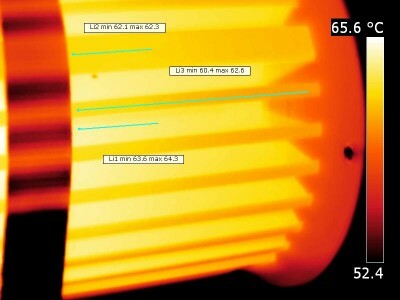 The hottest temperature on the lamp is at the heatsink, between the blades. The measured color temperature is about 5250 K which is cold white. The measurement of CCT is measured for inclination angles up to 65º and beyond the illuminance value gets very low (< 5 lux). 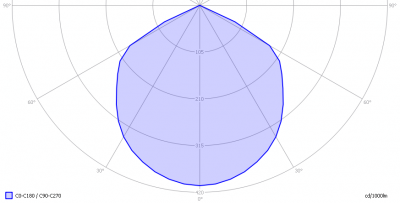 The beam angle is 114º, meaning a 57º inclination angle. In this area most of the light is present. 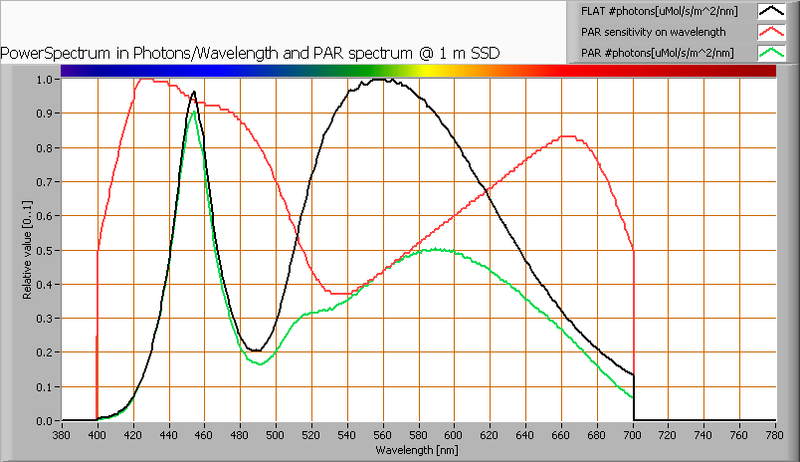 The variation in correlated color temperature in this area is about 4 %. To make a statement how well the light of this light bulb is for growing plants, the PAR-area needs to be determined. See the OliNo website how this all is determined and the explanation of the graph. 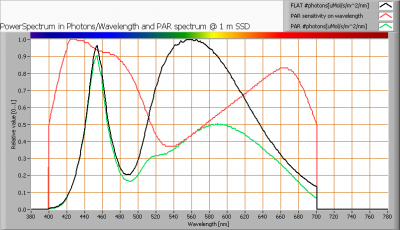 The PAR efficiency is 63 % (valid for the PAR wave length range of 400 – 700 nm). 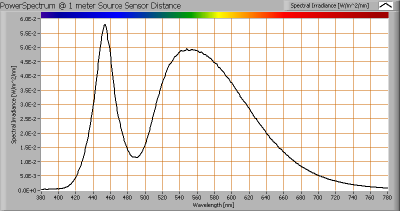 So maximally 63 % of the total of photons in the light is effectively used by the average plant (since the plant might not take 100 % of the photons at the frequency where its relative sensitivity is 100 %). The S/P ratio is 1.8. The light coming from this lamp is just outside the area designated with class A. This class A is an area that is defined for signal lamps, see also the OliNo website. Its coordinates are x=0.3406 and y=0.3786. The value of 70 is lower than 80 which is considered a minimum value for indoor usage. 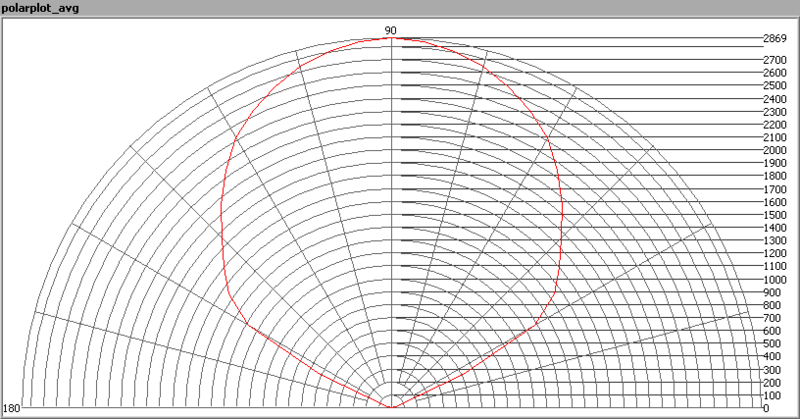 Note: the chromaticity difference is 0.012 indicates the distance to the Planckian Locus. There is no norm yet that states what the max deviation from white light is allowed to be. 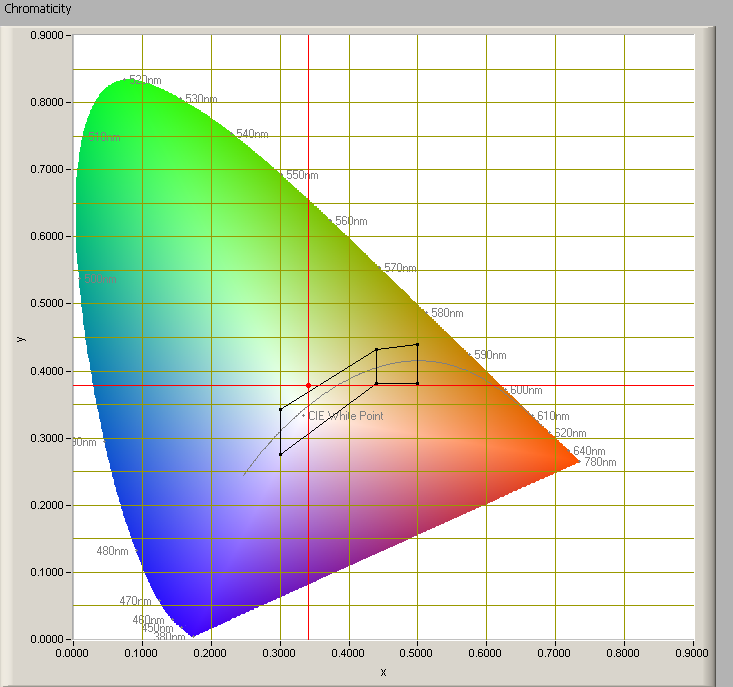 A reference with signal lights as a reference is given in the chromaticity diagram. 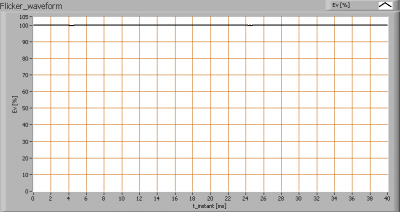 The dependency of a number of lamp parameters on the lamp voltage is not determined. 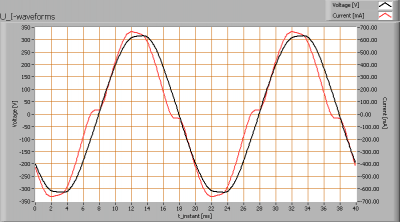 Effect of warming up on different light bulb parameters. At top the 100 % level is put at begin, and at bottom at the end. The warm up time is about 40 minutes. During that time the illuminance decreases with 8 %. An analysis is done on the measure of flickering of the light output by this light bulb. See the OliNo site for more information. 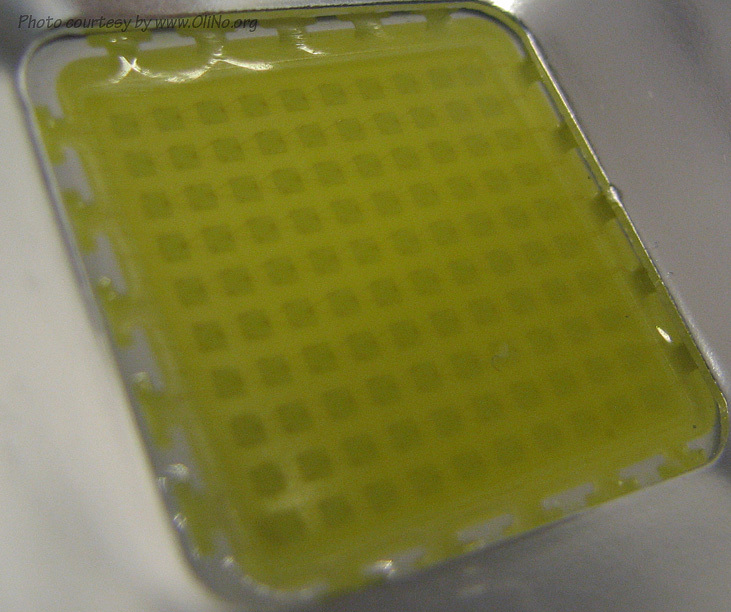 Close up of the led chip. Glo high bay led lamp are energy saving.